Start off your visit on the 4th (Fri): take in the dramatic natural features at Glacier Point and then make a trip to Olmsted Point. On the 5th (Sat), you'll have a packed day of sightseeing: take in the dramatic scenery at Yosemite Falls, then explore the striking landscape at El Capitan, and then get great views at Tunnel View. To see ratings, other places to visit, where to stay, and tourist information, read Yosemite National Park holiday planner. Denver to Yosemite National Park is an approximately 5.5-hour combination of flight and car. You can also do a combination of flight and bus; or drive. You'll gain 1 hour traveling from Denver to Yosemite National Park due to the time zone difference. Plan for slightly colder nights when traveling from Denver in October since evenings lows in Yosemite National Park dip to 28°F. Cap off your sightseeing on the 5th (Sat) early enough to go by car to Carmel. Carmel-by-the-Sea, often simply called Carmel, is a city in Monterey County, California, United States, founded in 1902 and incorporated on October 31, 1916. On the 6th (Sun), kick back and relax at Pacific Grove Shoreline Parkway Marine Refuge, enjoy the sand and surf at Carmel River State Beach, and then immerse yourself in nature at Point Lobos. To see photos, where to stay, and tourist information, you can read our Carmel route planner. You can drive from Yosemite National Park to Carmel in 5 hours. Alternatively, you can do a combination of car and flight; or do a combination of car, flight, and shuttle. Traveling from Yosemite National Park in October, Carmel is much warmer at night with lows of 52°F. Finish up your sightseeing early on the 6th (Sun) so you can go by car to San Simeon. Start off your visit on the 7th (Mon): look for all kinds of wild species at Elephant Seal Rookery, then stroll through Moonstone Beach, and then admire all the interesting features of Moonstone Beach Dr.
To find more things to do, maps, reviews, and more tourist information, use the San Simeon online trip builder . Traveling by car from Carmel to San Simeon takes 3 hours. Alternatively, you can do a combination of bus and car. When traveling from Carmel in October, plan for somewhat warmer days in San Simeon, with highs around 83°F, while nights are slightly colder with lows around 46°F. Finish your sightseeing early on the 7th (Mon) to allow enough time to travel to Friday Harbor. Start off your visit on the 8th (Tue): admire the majestic nature at Lime Kiln Point State Park and then take a memorable tour with Tours. On the next day, view the masterpieces at Island Studios, head outdoors with Springtide Paddlesports, then take in the dramatic natural features at Cattle Point, and finally explore the world behind art at San Juan Islands Sculpture Park. To see maps, reviews, traveler tips, and other tourist information, read Friday Harbor vacation planner . You can do a combination of bus and flight from San Simeon to Friday Harbor in 10.5 hours. Alternatively, you can do a combination of bus, train, and ferry. Traveling from San Simeon in October, expect nights in Friday Harbor to be about the same, around 45°F, while days are much colder, around 59°F. Wrap up your sightseeing on the 9th (Wed) early enough to travel to Astoria. 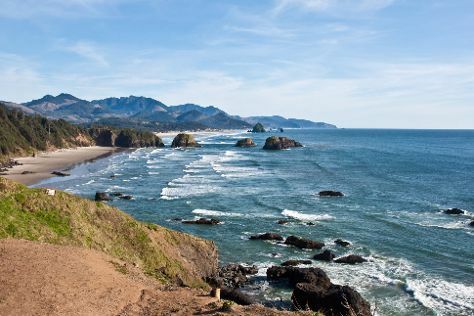 Start off your visit on the 10th (Thu): stroll through Cannon Beach, tour the pleasant surroundings at Haystack Rock, and then pause for some photo ops at Astoria Column. To find traveler tips, maps, where to stay, and tourist information, go to the Astoria trip planner . Traveling by combination of flight, train, and bus from Friday Harbor to Astoria takes 9 hours. Alternatively, you can do a combination of flight and bus; or do a combination of ferry, train, and bus. Expect a daytime high around 63°F in October, and nighttime lows around 48°F. Wrap up your sightseeing by early afternoon on the 11th (Fri) to allow time for travel back home.